Wolf Blitzer stopped by the set of Bravo’s “Watch What Happens: Live” last night to chat with Andy Cohen, briefly mentioning his new CNN documentary “Voices of Auschwitz” (that will premiere on Jan. 27). “Practice, practice, practice,” replied Wolf. “You want to be a cellist? You gotta practice. You wanna be a tennis player? You gotta practice. You wanna be a journalist? You gotta get out there and practice. Start reporting, start writing — just do it, do it and do it, and then you’ll work your way up. Cohen: You have interviewed many presidents — Obama, Reagan, George W. Bush, George H.W. Bush, Carter and Ford — Which president intimidated you the most? Cohen: Who is the dumbest politician you’ve ever met? 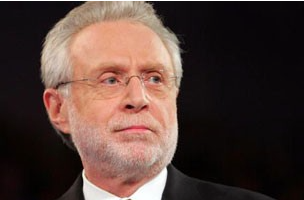 Blitzer: Mahmoud Ahmadinejad of Iran. Cohen: Who is the biggest blowhard on CNN? Watch clip courtesy of Bravo.